IN THE HOME of capitalism, the purchase and employment of professional footballers are tightly regulated, almost socialistic. Unlike in the United States, in purportedly Communist China, the same enterprise is red in tooth and claw. Money speaks. Loudly. And it is currently providing a siren song for a host of foreign professional players being lured to the Chinese Super League. The 16 clubs in its top division now number at least 75 foreign players between them, and the roster is swelling daily. Alex Teixeira, a 26-year-old Brazilian midfielder, is only the latest, joining Jiangsu Suning, which bought him from Shakhtar Donetsk in Ukraine for 367 million yuan ($55.8 million), a record transfer for an Asian club. The ink on the old record was barely dry: earlier in the week, Guangzhou Evergrande paid 308 million yuan for Jackson Martinez, a 29-year-old Colombia striker, who previously plied his trade for Spanish team, Atletico Madrid. That, in turn, had broken the record set at the end of January when Brazilian Ramires moved to Jiangsu Suning from Chelsea of the English Premier League for 237 million yuan. These are transfer fees of a size that would buy top players in Europe at the height of their careers, and there are reportedly wages to match. A host of Teixeira and Ramires’ fellow countrymen — a third of the 75 foreign players in Chinas top division are from Brazil, where they now joke that footballers have replaced commodities as the top export to China — along with Martinez and other internationals such as Ivory Coast’s Gervinho, have been vaulted into the ranks of the world’s best-paid professional footballers. Awaiting them is a galaxy of top coaches who have between them won pretty much everything there is to win in world soccer. It includes Luiz Felipe Scolari, who coached the Brazil national team at the World Cup and is now at Chinese and Asian Champions League reigning champions Evergrande ,and Sven-Goran Eriksson, a former England coach, who is now with Shanghai SIPG. If it is the money that is attracting such talent, the obvious question is why is so much cash being flashed now. The short answer is that the Chinese Super League, which opens its new season next month, is on the up and up. The corruption and match-fixing scandals of recent memory are now behind it. Within a couple of years, our man among the muddied oafs tells us, the league will be drawing the third highest crowds in the world to its games, behind only Germany’s Bundesliga and the English Premier League. But it is the long answers that are the more interesting; they involve that perennial Chinese overlap of commercial self-interest, political connections and national soft power, in this case through a ‘cultural industry’. In October, 2014, the State Council approved a national plan to raise the sports industry’s gross output to 5 trillion yuan by 2025 — almost 16 times its value in 2012. The Chinese Football Association’s part of that is manifested in a reform plan approved a year ago, setting a goal of qualifying for the World Cup again by professionalizing the game’s bureaucratic management and promoting youth participation. President Xi Jinping is reputedly a big soccer fan, and wants Chinese football to make its mark in the world. He understands that China has to increase its soft power along with the rise of China’s hard power. Football, which China claims to have invented (see picture above), would fit the bill. Xi has made no secret that he would like to see FIFA’s World Cup staged in China, which would be an affirmation of the country’s global standing — as the 2008 Beijing Olympic games were. At one point, 2036 was being talked of as the target date; now 2030 is thought to be the earliest feasible target. In the meantime, just getting the national team to qualify for the Finals is the goal. Plenty of wealthy businessmen have stepped forward to support the cause — especially the bolstering output part — by bolstering the domestic game. China Sports Media, a Shanghai-based cultural investment firm, outbid state-broadcaster CCTV for the broadcast rights to the Super League. This year, its 8 billion yuan five-year TV contract kicks in. Last season, the league’s domestic TV rights sold for 50 million yuan. That in itself is a marker of how fast-growing the domestic audience for the game is growing, as well as a reason that the competitive quality of the fare being served up has to be improved. The other half of the money side of the story is that construction companies seem especially attracted to a game that needs stadiums built, which, in turn, anchor all sorts of commercial, retail and residential development. Real estate interests own 13 of the 16 teams in the Super League’s top division. Guangzhou Evergrande is jointly owned by the eponymous real estate company and Jack Ma’s internet giant Alibaba (a smart deal for the property development group’s founder Xu Jiaxin, who paid 100 million yuan for the club in 2010 before selling half of it to Ma for 1.2 billion yuan within four years). In the other direction, Chinese state and private investors have bought Slavia Prague in the Czech Republic and Sochaux in France. They have a stake in Atletico Madrid and are paying $400 million for a 13% stake in the Gulf-based group that owns Manchester City in England, New York City FC, Melbourne City FC and a stake in Japan’s Yokohama F. Marinos. These are all investments in which the return is learning the mechanics of professional football club management in all its commercial and sporting dimensions. However, there is a huge divide to cross between having a richly paid foreign-star studded domestic league drawing a large TV audience and a national team capable of competing creditably against the world’s best it the World Cup, and an even greater chasm between the professional and grassroots games. The sheer weight of population implies that the country should be capable of producing eleven men who can play football along with the best of them. Even matching the China women team’s top-20 FIFA world ranking seems far off: the Chinese men’s national team has qualified for just one World Cup finals, in 2002, and is struggling to make it to Russia in 2018. To that end, the government has set a target of having 20,000 schools playing the sport on a weekly basis by next year as a platform for an even bigger programme. Meanwhile, Guangzhou Evergrande has built what is reputed the world’s biggest soccer academy (with a bit of help from Real Madrid), just one of thousands of academies that have been set up. However, developing the game at the grassroots is hard and patient work. It would always be foolish to bet against the state’s capacity to mobilize the country’s youth to create world-class athletes, but in countries, like Brazil, that do it naturally, the game is deeply imbedded in the popular culture, and played from birth in the favelas, on the beaches and in the streets, with Brazilian idols as role models. The situation of the game in China reminds this Bystander of the United States in the 1970s. The North American Soccer League (NASL) threw huge sums of money at aging South American and European stars in the hope it would kick start the game there. The League collapsed under the weight of its financial instability. The widespread acceptance of the game as being for anything but immigrants and expatriates took generations. The United States has a globally competitive national team, Americans play in the top leagues around the world and the domestic league, Major League Soccer, is increasingly strong and stable, having learnt the lessons of the financial excesses of its predecessor, the NASL. The lesson for China is that it was the children of those Americans who watched the NASL who started to learn football at school and college, but it was their children and grandchildren, who had grown up kicking a ball with their fathers and mothers and each other, who became good at it. Similarly, it will be the grandchildren of those watching Teixeira, Martinez, Ramires and the rest in the Super League this season who will be pulling on their red shirts for China in the World Cup Finals — long after this current mad spending spree by the clubs has burnt out. Update: Xi has made “hosting, qualifying for, and winning a World Cup” national goals, state media report. Control of the development of the game has been returned to the Chinese Football Association, with the Chinese Football Administrative Center, one of 21 sports departments of the General Administration of Sport, abolished. LI RUIGANG IS one of those particular Chinese combinations of government official, Party insider and entrepreneur — and perhaps a proto manifestation of the statist-corporatist economy that President Xi Jinping sees as China’s future. In the 2000s, a 30s-something Li, though a state official who had started out with a degree in journalism and a job as a reporter on a local Shanghai TV station, was a pioneer in China’s fledgling media market. Rising rapidly through the programming ranks, he brought foreign programming and popular international TV formats to the staid, insular world of state broadcasting. He also married TV and radio with online and mobile media, riding the emerging wave of young newly affluent Chinese going online. As president of Shanghai Media Corp., a state broadcaster formed in 2002 when the city’s television and radio stations merged, he turned a municipal broadcaster into a national media powerhouse. His vision of popular programming allied to mastery of the crease where global popular culture meets Chinese mass propaganda meant that even staid national state broadcaster CCTV could not ignore SMC’s transforming influence. In western media terms, he was a meld of such media moguls as News Corps’ Rupert Murdoch and Viacom’s Sumner Redstone, both of whom Li numbers as friends. As the photo above indicates, he now moves in that world of the global great, good and successful. By 2009, Li had overseen a fourfold increase in SMC’s revenue to $1.2 billion. That year, he founded China Media Capital Holdings (CMC), a state-backed Shanghai-based private equity and venture capital firm specializing in cultural, media and entertainment investments inside and outside China. At the same time, he started to scale back his work at SMC, though he would not finally cut formal ties until this year. Li’s motives for switching from state official to state-backed venture capitalist are complex. Not all his programming deals with foreign media companies panned out. A public sale of SMC shares planned for 2009 was put on ice following the 2008 global financial crisis. Other political constraints on SMC’s freedom to do deals with foreign partners started to chafe. But Li was not railing against the system. In 2011, when he stepped down from full-time management at SMC, he would become deputy Party chief in Shanghai. He retained the confidence of his political superiors that he could be trusted in the fast evolving world of media, even as the soft power of cultural assets became more of a national concern. with Jack Ma’s Alibaba and Tencent, a company to develop InternetTV. CMC’s latest deal, announced this week, is a $400 million 13% stake in City Football Group. CFG is the holding company owned by Sheihk Mansour from the United Arab Emirates for English professional football club, Manchester City FC, its U.S. sibling, New York City FC, its Australian cousin Melbourne City FC and a stake in Japan’s Yokohama F. Marinos. Li is following another Chinese entrepreneur, Wang Jianlin, founder of the property group Dalian Wanda, in investing in European professional sports. Both men have an eye to exploiting the Chinese TV market for watching the teams’ games, buying their merchandise and learning the ropes of what is becoming an increasingly lucrative part of the media business. Even back in his SMC days, Li understood the importance for broadcaster of both creating and owning content and having the means to distribute it. CMC already owns a slate of sports media rights, including those for Chinese Super League. It blew away CCTV for those with a spectacular five-year 8 billion yuan ($1.3 billion) bid in October; previously the rights had sold for 50 million yuan a year. The Manchester City deal might also prove an avenue for improving the woeful standard of the game within China. President Xi would love for the country to hold its head high as a world footballing power. China ranks 84th in Fifa’s global rankings for national teams and is not even number one in Asia. South Korea is 48th and Japan 50th. Xi would also like China to host a World Cup, as South Korea and Japan have already done. A World Cup final in Beijing would, like the 2008 Beijing Olympics, be another sign of China’s emergence on the world stage. Li’s deal, reportedly two years in the making, now seems it make it clear why Xi chose to visit the Manchester City club during his recent state visit to England. 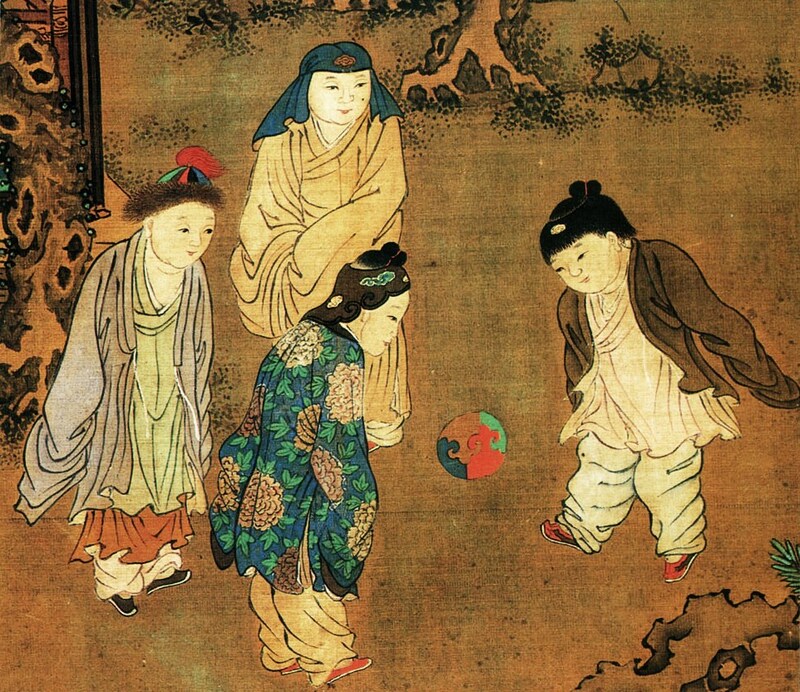 A Song Dynasty painting by Su Hanchen, depicting Chinese children playing cuju. ONE AREA IN which China is not an emerging power but wishes it was, is football. As our man among the muddied oafs has noted before, China quietly harbours ambitions of staging a FIFA World Cup. However, for now, the national team, still recovering from the corruption and match-fixing scandals that beset the professional game in the not so distant past, does not match up to that expectation. Despite its unexpected success in reaching the quarter-finals of the recent Asian Championships, it currently still ranks joint 83rd in the FIFA World rankings (though the women’s national team ranks 16th). President Xi Jinxing is a fan of the sport, which China claims to have invented (see picture above). Xi also understands the statements about national soft power that sporting success can make. So there is a state plan. The State Council has issued a 50-point development plan. One of the central points is to switch responsibility for developing the sport to the China Football Association from the General Administration of Sport. That may restore some of the authority the association lost after the corruption scandals. Another is to boost the game in schools. One immediate impact of this is the creation of a school football leading group. It comprises the education ministry and five other government departments, including the National Development and Reform Commission, which suggests it will have some clout. The education ministry says it is increasing the number of primary and secondary schools designated as football academies to 20,000 by 2017 from 5,000 now. This will mean they get new facilities including pitches, which across China have been swallowed up for property development in recent years. Thirty counties will trial promoting the development of young players and raising the popularity of the game among schoolchildren. Last November, education minister Yuan Guiren said that football would become a compulsory part of physical education classes in all schools and that 6,000 school coaches would be trained this year. Seven volumes of instructional text books are in preparation, according to the People’s Daily. The goal is for there to be 50,000 schools specialising in football by 2025. In 2016, football will become an option in the national university entrance examinations in an attempt to overcome parental reluctance to let their children swap studying time for chasing a ball around a pitch. With Qatar cementing its hold on the 2022 World Cup, the next likely opportunity for China to host the tournament for the first time is 2034. Would China have a team suitably good enough by then? Never discount the power of Party discipline, but as the U.S. has shown, two decades is the bare minimum for raising a generation of footballers good enough to compete with the world’s best. Since time immemorial professional football clubs have been the playthings of successful businessmen. Alibaba’s Jack Ma, by taking a 50% take in Guangdong Evergrande for 1.2 billion yuan ($192 million), is following an ancient tradition. Why is he doing it? He has shown no interest in the game previously. There may be money to be made. Talk is of an eventual public flotation of the club, though in Europe listed football companies have not proved particularly successful for investors. Many have reverted to closely held ownership. It may be that there is a branding play for Alibaba as it spreads its wings beyond e-commerce, Ma has couched his investment in the football club in terms of buying entertainment content. He would not be the first billionaire to see football as such. Rupert Murdoch was a pioneer in that regard. Evergrande’s success on the field since real estate tycoon Xu Jiayin bought the club in 2010, makes it preeminent among China’s teams, a prerequisite for building a merchandising and media brand. Alibaba has been on a spending spree ahead of its planned blockbuster listing in the U.S., splashing out some $6 billion on acquisitions to broaden its portfolio of businesses. Most have been Internet companies, but it is starting to make inroads into media and entertainment. Sport, though much changed by television, has not been significantly disrupted by technology. At least not yet. And it is not costing Ma much in the global scheme of things to try. CHINA’S NATIONAL FOOTBALL team squeaked into next year’s Asian Cup finals this week by the narrowest of margins. It was a sobering welcome for new coach Alain Perrin (above), appointed by the China Football Association late last month after a lengthy search for a successor to Jose Antonio Camacho. The former Real Madrid manager was ousted last June in the face of the team’s continuing dismal performance. Perrin is little known outside of football circles in his native France. He won cups and a league titles there but his greatest reputation is as a stop gap. None of his eleven appointments — he most recently managed Qatar’s Olympic team — have lasted longer than eight months. That may have been the strongest selling point of his resume. Our man among the muddied oafs says that the CFA wants to appoint to the job Marcello Lippi, the Italian who manages Guangzhou Evergrande. Lippi coached Italy in the 2006 FIFA World Cup, which it won. Last November his Guangzhou Evergrande won the AFC Champions League – the first time that a club from China had lifted the trophy. Lippi’s contract with the club is up at the end of this year. This Bystander is not surprised to read that Perrin’s payoff will be slight if he is dismissed, nothing like the 51.5 million yuan ($8.4 million) Camacho and his coaching staff reportedly walked away with once they were shown the door. China lies 88th in FIFA’s global country rankings and barely scrapes into Asia’s top 10. Lippi would have a huge challenge ahead of him in getting the national team to qualify in 2018 for what would be only its second World Cup finals. The country’s football is only slowly overcoming the corruption, bribery and match-fixing scandals that plagued it in years not too recently past. Lippi may have some technological assistance not available to his predecessors. China is putting some of its best researchers to work on video analysis of the national team’s games. Teams (of academics) at the Chinese Academy of Sciences, the National Natural Science Foundation, Xian Jiaotong University, and Tsinghua University have been tasked with devising a computer system that can identify the team’s strength’s and weaknesses — though identifying the weaknesses hasn’t been the problem, particularly for China’s opponents on the field. One migrant worker is on the move ahead of New Year, but won’t be coming back. Nicholas Anelka, the French footballer who joined Shanghai Shenhua at the beginning of 2012, is returning to Europe. He is moving to Juventus of Turin after playing just 22 games for the Shanghai club. Shenhua finished the season ninth in the Super League. The sulky striker scored just three goals, and failed to fulfill the hopes that he would be among a wave of star names to revive the league as it recovered from corruption and match-fixing scandals. Chinese companies build sports stadia all over the world, though usually in developing nations not in one of Europe’s larger economies. So this Bystander is not sure whether state-owned China Railway Construction Corp.’s decision to become part of a Chinese investor group that is about to become the second largest shareholder of Italian football powerhouse Inter Milan–and get to build its new stadium–says more about it or the parlous state of the Italian economy. The deal values the Italian team at $600 million, which would make it one of the 10 most valuable football clubs. The Chinese investor consortium, which includes QSL Sports, run by Kenneth Huang Jianhua (above left), a 15% stake. The lady in the center of the photo is China Railway Construction’s Kamchi Li; Inter’s Massimo Moratti is to the right. Huang and Li, along with financier Fabrizio Rindi, are joing the board of the club’s holding company following the deal. The Moratti family, which has been looking for outside investment for the club for some time, will remain the controlling shareholder of the football club. China Railway Construction, for the benefit of younger readers, is the old railways construction arm of the People’s Liberation Army. It is now a state-owned enterprise with a Hong Kong listing. Inter currently shares the venerable but municipal-owned Giuseppe Meazza stadium, better known still by its original name, the San Siro, with its cross-town rival AC Milan. But Inter’s president Massimo Moratti has long wanted to move his club to a home of its own. Now he has some one to build it.